There is no denying that tea is perfectly suited to sipping. Yet, for centuries the esteemed Asian cultures have enjoyed a Tea Bath to beckon a sense of self-renewal and realignment of spirit. For, they believe that Bath Tea contains He Shou Wu (the "Elixir of Life"). And, it is the He Shou Wu that is said to remove skin-clogging pollutants and purge impurities, while reviving one’s soul. And so, it is in that honor that our Tub Tea collection has come to be. Here, we have assembled a proprietary blend of whole Green Tea, White Tea and Rooibos (African Red Tea), as well as herbs, botanicals, dried fruits, Dead Sea Salts, Baking Soda and soothing oatmeal. Each ingredient is masterfully wed with oils of Hemp Seed, Flax Seed, Cherry Kernel and Meadowfoam and tossed with Sacred Lotus Extract, as well as exquisite essential oils that scent, soothe and rebalance the skin. 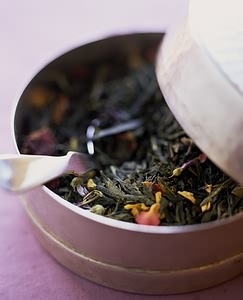 So, if you have never had a beauty steep, there is no time like the present – to try our sacred Tub Teas. Namaste! Here, we wed our signature Tub Tea blend with Rose buds and exquisite Rose essential oils to sweeten your bath water and gorgeously scent your skin. If you are a Tea Bath connoisseur -- and you have yet to find a Bath Tea that satisfies your discerning palate, give this rare and wonderful blend a try. Each Tea Bath is presented in a 16 oz. tin. A gratis bath pillow is included. Here, our signature Tub Tea is wed with young Lavender Buds, Lavender Essential Oil, and a sip of Japanese Sake to enhance your bathing ceremony. Wait until you soak in this liquid gem. The unexpected addition of Sake adds a level of depth that will leave you captivated with this Bath Tea from start to finish. In fact, even the legendary Geisha's never had it so good! Each Tea Bath is presented in a 16 oz. tin. A gratis bath pillow is included. Here, our signature Tub Tea marries well in a bath of Orange Essential Oil, dried Oranges, Ginger and a splash of Italian Bergamot. This refreshing bath tea offers and Ayurvedic boost to your bathing ritual. One steep offers a spa holiday that integrates a serene spirit, with a cleaner body temple and more relaxed mind-set. This is a must for stressed skin and a weary spirit. Each Tea Bath is presented in a 16 oz. tin. A gratis bath pillow is included. Here, our signature Tub Tea is paired with organic Ginger for an herbaceous Tea Bath. Lemongrass is added, along with seven essential oils, for a gorgeous Bath Tea that has a mellow yet invigorating finish. Each Tea Bath is presented in a 16 oz. tin. A gratis bath pillow is included. Here, our signature Tub Tea blend is blessed with delicate buds of African Jasmine and soaked it in pure Jasmine Extract for a fragrantly seductive Bath Tea that will leave a haunting mist of natural perfume on the skin. This is an uncompromising soak that is nothing short of a true delicacy! Each Tea Bath is presented in a 16 oz. tin. A gratis bath pillow is included.